About three minutes into the second and Boston on a power play, the puck popped toward center ice and Marner had a clear path to the goal. When he was just outside the crease, Jake DeBrusk was called for bringing him down from behind, and sending him crashing into Rask. DeBrusk walked down the tunnel and into the dressing room after the crash into the boards, but later returned to play. The Leafs have only been awarded four postseason penalty shots, and the only other time they have scored was Mats Sundin against Buffalo on May 29, 1999. The Bruins have given up six postseason penalty shots, just two of them successful. The last attempt was by Philadelphia's Ville Leino in 2010. 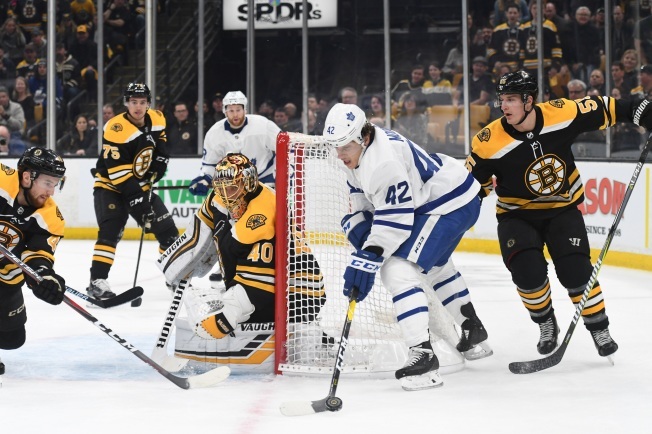 The Bruins outshot Toronto 21-14 in the second period, but gave up two goals. Toronto trade deadline acquisition Jake Muzzin missed the final regular-season game, but played Thursday and assisted on Marner's first goal.